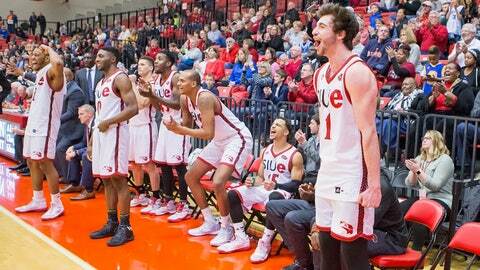 Burak Eslik (1) scored 22 points as SIUE snapped a 15-game losing streak on Saturday night. EDWARDSVILLE, Ill. — Burak Eslik scored 22 points and SIU Edwardsville closed out its season by snapping a 15-game losing streak, winning its first conference game of the year 78-59 over Eastern Illinois on Saturday night. Josh White finished with 20 points and Jalen Henry added 13 for the Cougars (6-24, 1-15), who held a plus-11 advantage on the glass and forced 16 Panthers turnovers. Muusa Dama scored 18 points to lead Eastern Illinois (14-15, 6-10). The Panthers made just 17 total field goals and finished 3 of 14 from long distance. SIU-Edwardsville took a double-digit lead on a jumper by White with 14:47 left. Eastern Illinois kept the deficit within a manageable distance until an 8-0 run by the Cougars pushed it to 15, 68-53, and put the game out of reach.